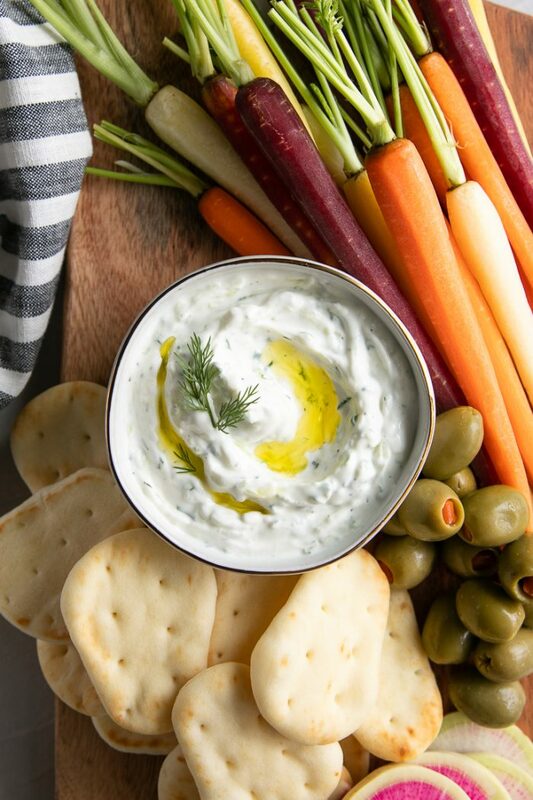 Made with refreshing cucumber, creamy Greek yogurt, and fresh dill, this delicious Tzatziki Sauce Recipe comes together in just 10 minutes! Learn all about How to Make Tzatziki and enjoy with your favorite vegetables, crackers, or wrapped in these easy Chicken Gyros. 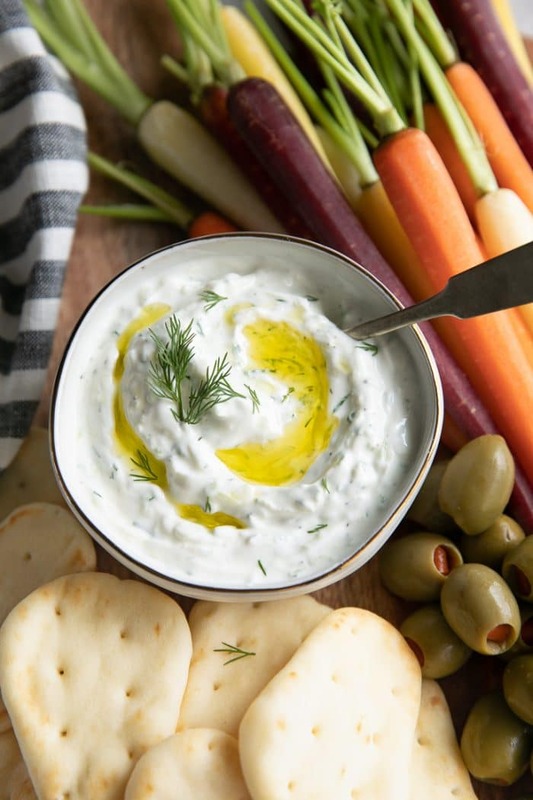 Tzatziki (pronounced, Tsaht-ZEE-kee) is a deliciously easy 6-ingredient sauce made with simple ingredients such as plain Greek yogurt, cucumber, garlic, and fresh dill. 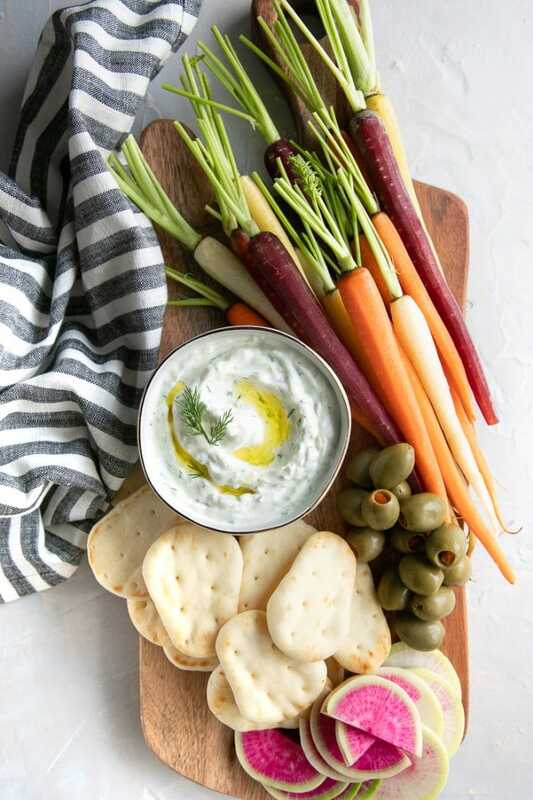 Refreshing and delicious, tzatziki is best served chilled with your favorite veggies and snacks. 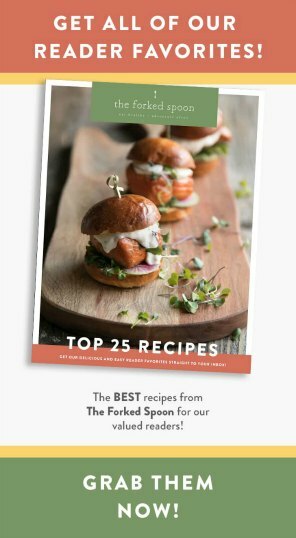 A popular condiment served at many Mediterranean restaurants, tzatziki is the perfect complement to meat dishes such as these Herb Marinated Chicken Skewers or Steak Bites, or alongside these Grilled Veggie Skewers. 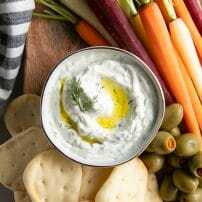 Cool, creamy, and refreshing, tzatziki is also perfect for mellowing out super spicy recipes or anything loaded with lots of spice. Personally, I love to grill some lamb and vegetables and serve it with rice, pita, and tzatziki. What is the difference between Raita and Tzatziki? Identical in several different ways, it’s easy to confuse tzatziki and raita. 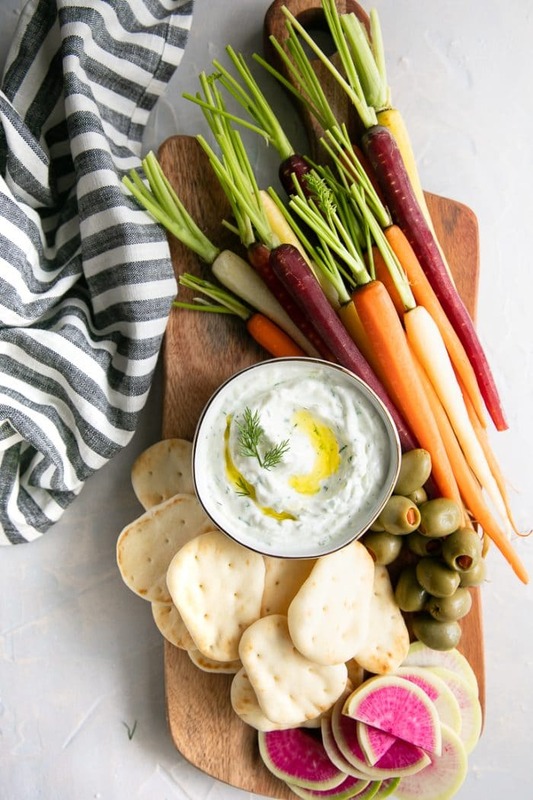 Made with plain yogurt, these dips may look the same but come with a few major differences. Tzatziki – Originating (at least by name) from Greece, with variations served throughout the Mediterranean and the Middle East. 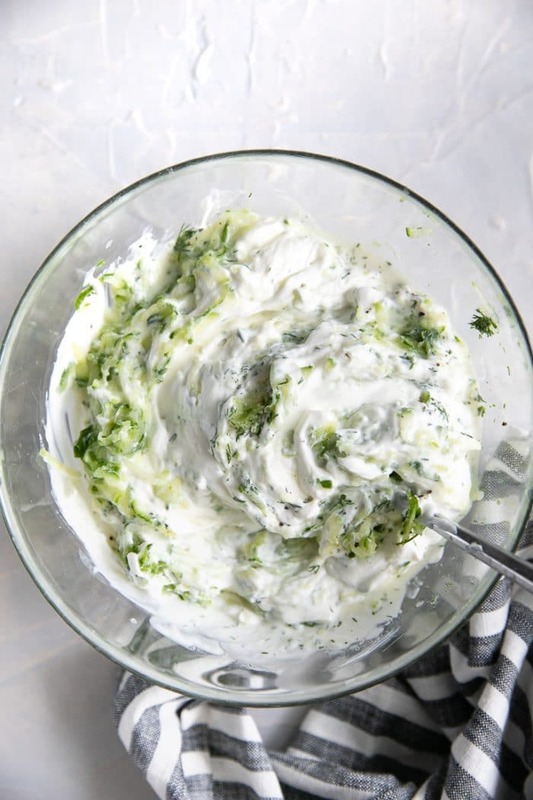 Unlike raita, tzatziki is almost always made with cucumbers and typically includes at least one of the following herbs – dill, mint, or parsley. Riata – Popular throughout India, riata is somewhat more flexible than tzatziki when it comes to what’s added to the yogurt. Cucumbers are one possibility, but carrots, onion, pineapple, and dried fruit are also frequently added (among other things). In addition to dill, mint, and parsley, fresh coriander (cilantro) may also be added. 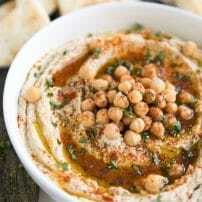 Finally, much unlike tzatziki, riata loves spices such as cumin, cayenne, and ginger, to name a few. Is tzatziki Greek or Turkish? Tzatziki, a Greek word, was derived from the Turkish word, Cacik (pronounced, ja-jik). Interestingly, this Turkish word for cucumber yogurt sauce is actually believed to come from the Armenian word Cacıg. Keeping this in mind, one may say that Tzatziki is, at least by name, Greek. But the origin of Tzatziki? Not Greek. And perhaps not even from Turkey, but Armenia. Since tzatziki comes with just a few ingredients, it’s important to make sure that each is fresh. Plain full-fat Greek yogurt. Does the yogurt have to be full-fat? No. But I highly recommend that it not be fat-free. The yogurt, believe it or not, contributes great flavor and texture. Fat-free yogurt just won’t be the same. Does it have to be plain? YES. Finally, if you prefer to use goat or sheep milk, that is totally fine, too (and actually more authentic). Cucumber. I always use a cheese grater to shred my cucumber. For this specific recipe, I added one whole English cucumber, but feel free to add more cucumber if you really love/want a little extra cucumber flavor to shine through. Of course, the most important part is making sure you squeeze as much water from your shredded cucumber before mixing with the yogurt. Garlic. I added just a few smallish cloves of garlic as I didn’t want to overwhelm the whole thing with garlic flavor. I do not recommend substituting with garlic powder and the taste and flavor will be completely different. Fresh Dill. Dill is one of those herbs that simply belongs with cucumber and yogurt. Tzatziki would not be tzatziki without at least some amount of fresh dill added to the mix. You may add chopped parsley if you wish, but in this case, I stuck to the basics. Lemon Juice. A little bit of fresh lemon juice goes a long way, so no need to dump a whole cup in there. And please please do not use concentrated lemon juice. Substitute with white vinegar if desired. Salt + Pepper. You will want to add some salt and pepper to taste. 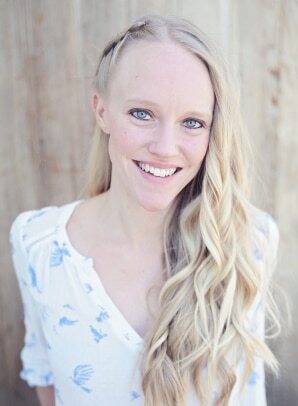 The total amount will vary depending on personal preference, so I always recommend adding a little at a time. Do you have 10 minutes? 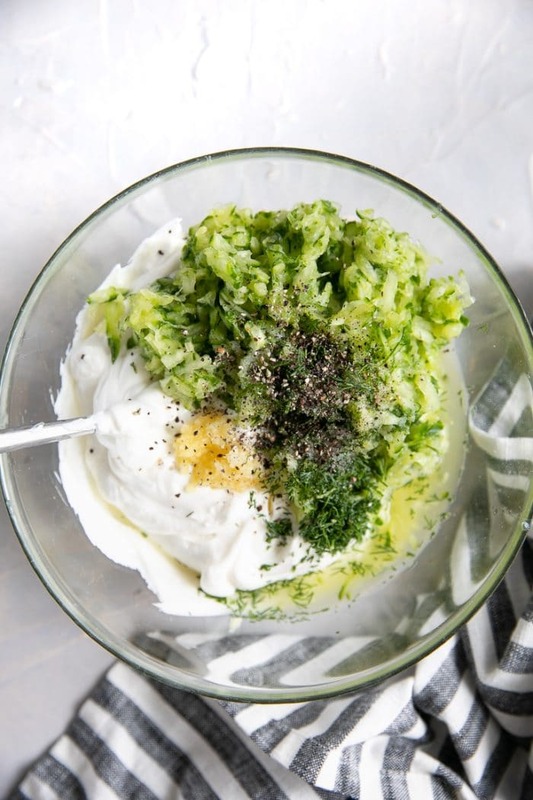 Then you have more than enough time to make this super easy and healthy tzatziki sauce! Prepare the Cucumber. Shred or grate your cucumber using a box grater or Microplane grater and transfer to the center of a cheesecloth, fine mesh sieve, or double-lined paper towels. Gather at the center to make a little sack and squeeze as much liquid from the cucumber as possible (the amount released may surprise you). You want at least 1 cup of shredded and drained cucumber in total. Combine – Combine the cucumber, yogurt, fresh lemon juice, minced garlic, fresh dill, and salt and pepper, to taste, to a medium mixing bowl. Mix well to combine. Serve – Drizzle with 1-2 teaspoons of good quality olive oil and serve chilled with your favorite crackers, vegetables, or grilled meat. The most important part of preparing tzatziki is making sure your grated cucumber is well drained. 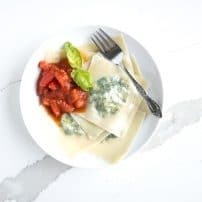 You may do this in a fine mesh sieve overnight in the refrigerator, or squeeze out the liquid by placing the cucumber in a cheesecloth or double-lined paper towel. Garlic can be somewhat sharp and overwhelming when first added to the yogurt. To help bypass some of this, pre-mix the yogurt, garlic, and lemon juice ahead of time, allow it to rest overnight, and add the drained cucumber and dill just before serving the following day. Do you have to peel the cucumbers before shredding? No. You’re already going to be shredding your cucumber into such small bits, I can almost guarantee that you won’t even notice it’s there. So unless you can’t eat the skin of cucumber or you’re trying to trick small children into eating more vegetables, I’d save the time and leave it on. How long can you safely store leftover tzatziki in the refrigerator? I have been known to enjoy this up to 5-6 days later. However, food safety would recommend that you enjoy much sooner, as in, 2-3 days. Have a question? Leave me a comment below and I’ll add it here. What can you serve with tzatziki? 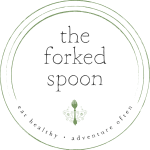 Honestly, this magical yogurt sauce goes so well with so many things it’s easier to suggest things not to serve it with…like Thai food or Chinese food. But aside from all those noodle-heavy, umami, and soy sauce based cuisines, tzatziki is a happy camper with just about everything. For example, make it a meal with this Chopped Mediterranean Salad and Mediterranean Grilled Turkey Burgers. Those turkey burgers, equally healthy and easy, really love being topped with tzatziki. Keep things even easier with these Mediterranean Chicken Wraps with Hummus (which would also happily convert into easy leftover meal prep). If you try making this Homemade Tzatziki Sauce Recipe, please leave me a comment and let me know! I always love to hear your thoughts. PLEASE, DON’T FORGET TO PIN AND SHARE THIS TZATZIKI SAUCE RECIPE AND ADD IT TO YOUR NEXT WEEKLY MEAL PLAN! Made with refreshing cucumber, creamy Greek yogurt, and fresh dill, this delicious Tzatziki Sauce comes together in just 10 minutes! Prepare the Cucumber - shred or grate your cucumber and transfer to the center of a cheesecloth or paper towels. Gather the cheesecloth at the center to make a little sack and squeeze as much liquid from the cucumber as possible (the amount released may surprise you). Combine - Combine the cucumber, yogurt, fresh lemon juice, minced garlic, fresh dill, and salt and pepper, to taste, to a medium mixing bowl. Mix well to combine. Serve - Drizzle with 1-2 teaspoons of good quality olive oil and serve chilled with your favorite crackers, vegetables, or grilled meat.